In 2008, in order to comply with amendments to the Child Abuse Prevention and Treatment Act (CAPTA) that required enhanced linkages between child protective services and public health, mental health, and developmental disabilities agencies, the Commonwealth of Pennsylvania established a statewide developmental and social-emotional screening program. The amended CAPTA legislation, which required children 3 and under to receive a developmental screening within 30 days of welfare case acceptance, was expanded in 2010 to include homeless children and children in residential treatment facilities. DPW’s own guidelines for screening Pennsylvania’s children go beyond the CAPTA obligations, and were created to ensure children who enter the child welfare system receive timely referral to services and have better outcomes. They include recommendations that all children with open welfare cases receive follow-up screenings until they turn 5, among other recommendations. When the statewide screening began, DPW worked through various entities—including the joint DPW/Department of Education Office of Child Development and Early Learning (OCDEL), the DPW Office of Children, Youth, and Families (OCYF), and the OCDEL-sponsored Pennsylvania Keys—to offer training and assistance in integrating the use of the ASQ system into existing practices and procedures. It’s been six years since Pennsylvania’s statewide screening initiative began. So how is the state progressing with the implementation and toward its goals of becoming CAPTA-compliant and meeting the developmental needs of children in the child welfare system? 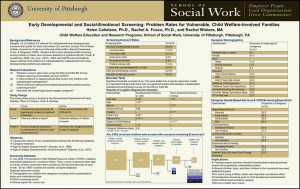 Researchers at the University of Pittsburgh, School of Social Work, Child Welfare Education and Research Programs are answering those questions and more. They began a three-phase research project in June 2009 to examine three key areas: program implementation, demographics and screening results of participants, and the caregivers themselves. So far, the team’s findings have been the subject of presentations at twelve national conferences, two state-specific conferences, and three print publications. 1, 2, 3 Ten research briefs and three reports are also available. The study took an in-depth look at the screening process and many of the children and caregivers involved in it. A lot of interesting facts and findings were revealed, but the major takeaway was the undisputed value of screening all young children—and how the screening process itself is beneficial to both children and the caseworker-caregiver relationship. “In speaking with both child welfare caseworkers and caregivers of children in the child welfare system, we found that the developmental and social-emotional screenings provided both parties with an opportunity to work with each other in a strength-based way,” explains Rachel Winters, M.A., the project’s senior evaluation coordinator. “Child welfare caseworkers were able to engage caregivers around their child’s strengths and things that could be improved on. Caregivers involved in the child welfare system were able to witness their children achieving milestones that they hadn’t realized they had reached, which instilled them with a sense of pride not only in their child, but in their parenting ability as well,” she adds. Statewide implementation led to expanded screenings. The study’s phase I efforts involved interviews with child welfare and early intervention agencies throughout Pennsylvania. A first round of interviews found that 43% of counties were following the minimum federal mandate to screen only children under age 3 with a substantiated maltreatment. Follow-up interviews two years later revealed only 38% were following the mandate—in fact, there was an increase in the number of counties going above and beyond the federal mandate. Most were screening any child with an open case under the age of 5 (instead of age 3), aligning their programs with Pennsylvania’s newly expanded recommendations. No clear link between abuse and low screening scores. For phase II, the study team created a web-based data entry system to collect demographic and screening results of 4,669 children from 60 counties across the state. They found that while almost one-half of all children showed a developmental or social-emotional concern, the rates of problem-range screening scores did not differ between children with substantiated vs. unsubstantiated cases. The research team’s recommendations focused on incorporating best practices into the screening process. Revise the current policy to include all children in the home. Because there was no link between welfare case status and developmental/social-emotional concerns, it’s important that all children under age 5 are screened, not just ones involved in the welfare system. Enhance collaboration between child welfare and other developmental programs. Better cooperation benefits the child and family. Educate caregivers about child development. Interviewers heard over and over again that caregivers were unaware of their children’s ability to perform so many tasks. Most also requested additional information on development and recognizing delays. The research team advised that the ASQ activity sheets (available in the User’s Guides and the ASQ®-3 Learning Activities) could support this recommendation, and that counties include the distribution of these materials as a standard part of their screening process. Build regional teams to conduct screenings. To ensure better screening accuracy, it was recommended that counties form teams of specially trained screening specialists. In addition to providing better quality screenings, this could have the added benefit of allowing specific caseworkers to develop a specialty area, improving job satisfaction and retention. Enhance child protective resources in the family context. Recommendations included addressing socioeconomic needs, increasing social support, and promoting access to behavioral health services for both children and caregivers. Want to learn more? 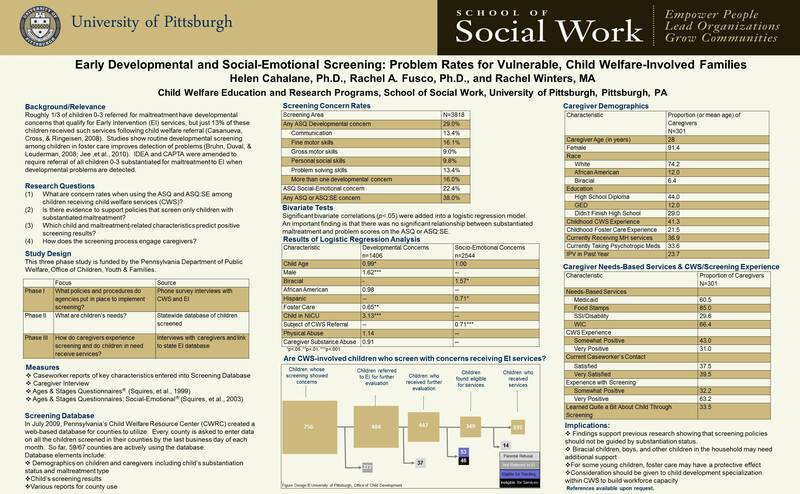 For a more detailed look at the findings and recommendations of this three-phase study, please visit the project website for the Child Welfare Education and Research Programs of the University of Pittsburgh, School of Social Work. 2 Fusco, R.A., & Cahalane, H. (2014). Young children in the child welfare system: What factors contribute to trauma symptomology? Child Welfare, 92(5), 37-58. 3 McCrae, J.S., Cahalane, H., & Fusco, R.A. (2011). Directions for developmental screening in child welfare based on the Ages and Stages Questionnaires. Children and Youth Services Review, 33(8), 1412-1418. In an article on “The Social-Emotional Well-Being of Young Children in Foster Care” that appeared in the Pennsylvania Child and Adolescent Service System Program Newsletter, Chelsea Quattrone tells about the youngest of three brothers being cared for in a foster family. When his foster parents couldn’t figure out what to do to help Ben, a 20-month-old who cried constantly during his waking hours and slept 19 hours at a time, their foster care case worker had them complete the ASQ and ASQ®:SE questionnaires. An overview of the study background and design, plus demographic and ASQ screening data. 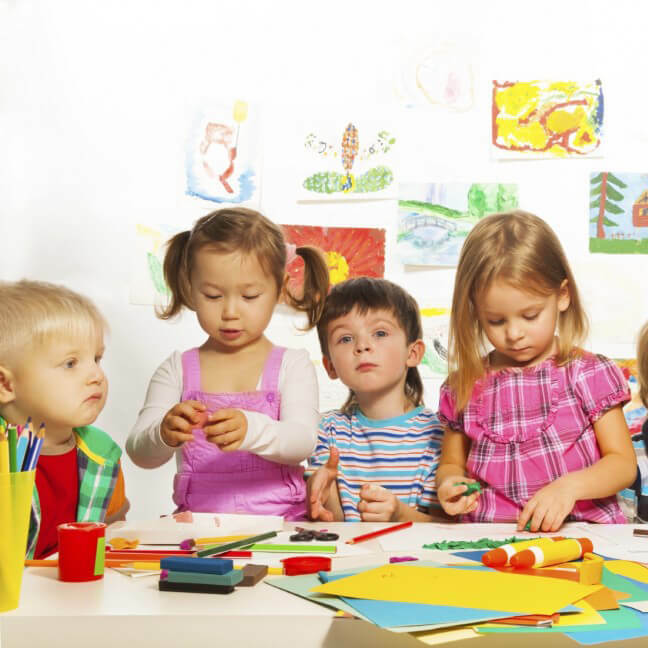 Ages & Stages Questionnaires®: Social-Emotional as the program’s screening tools of choice.